We are still waiting on PA. It’s been 51 days, so we are not overdue (since we are a large, uh, I mean a LARGE family) but with each passing day, we become the tiniest bit more anxious. But we know what God started, He will bring to completion. We have some concerns about Shepherd’s hands and his ability to grasp and utilize his hands fully. So far, no new information has been forthcoming, even though we have requested it. We are praying to hear something soon so we will be able to set up appropriate appointments and therapies should they be necessary once he arrives home. 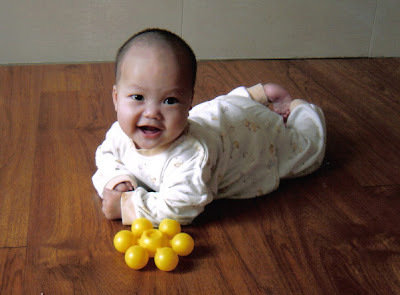 We have learned that at his orphanage, the baby to nanny ratio is 20 to 1. Please keep Shepherd in your prayers. We’re getting excited around here. I mean really excited. With every step closer, the anticipation level increases. And with the outpouring of love and support we have received from you guys, it’s hard NOT to get excited!! Thank you so much, to all of you, for playing such a big part in helping to bring this little guy home. We can’t wait. It is so hard to sit thousands of miles away and worry about your child. I am sitting in the same position as you, worrying about our children together. I hope both our fears are unfounded. See! You MAY have a LARGE family but you are nothing like that 20:! ratios (smiles!!) Shepherd is in our prayers and I cannot WAIT to see him come home:) I know it has to be so much harder when you have a face to go with the name & the dream and the prayers…. He is just SO adorable! I want to pick him up and hold him, and I know you want that SO much more. I can’t wait to hear I have that PA too for my little one (though I’m pretty far behind you at around day 20ish). I love your blog and reading about your gorgeous family. I wish you the best with your son’s adoption and know God will take care of everything. Your son’s in our prayers. Prayers going up for you and little Shep. I do know what you are feeling. Take comfort that he will thrive once in your care and all this time waiting is gone in an instant. He doesnt know any different yet, so when he comes home to you it will be so sweet for him. This is what adoption is all about! GOd will hold him close for you! Praying you to the day that PA arrives and then to China to get that precious baby!!! I pray a blessed day for you and your family today!!! I remember the wait for PA. I had forgotten about it until I just read your post. Amazing how we forget the pains of labor and the pains of waiting! Lord, keep little Shepherd in your keeping place, safe and sound and warm and loved, and speed the time until he can come home. Stefanie have you heard that Steven Curtis Chapman song “You are being loved.”? It makes me think of Shepherd and all the other waiting children all over the world. Right now, at this very moment, they are being loved! Can’t wait to see him home! Our Sophia could awkwardly grasp things (barely) when we got her at 11 months. If she got something in her hand, she couldn’t lift her arm to put it to her mouth (cheerio or toy). That quickly changed without therapy. She’s caught up so quickly. Praying for the same outcome for your boy. I am so excited for you! It seems to be that I say the same thing over and over for you. But, excitement is contagious (just ask our kids right??) Praying that Shepherd is comforted and strengthened until his baba and mama can wrap their arms around him!! Shepherd is so beautiful. I just can’t wait for him to be home with that big, wonderful family of his. 🙂 He is going to thrive with all of the love & attention!! What a lucky (blessed!!) little boy!! Remember that your sweet baby is in the safest place he COULD be – the palm of God’s hand and surrounded by His love. I will be praying for that sweet little guy. I will also pray that you will get an update on his hands so that you can be all prepared medically! We are all so excited WITH you!! It is so funny how you can forget how painstakingly long that wait for PA can be. Even if you have the strongest faith and you feel you are doing what God has called you to do, there is such anxiety over waiting for the approval from the CCAA and such a rush of relief when it comes. Praying that you will hear soon so that you can rightfully celebrate, and focus your thoughts on counting down to LOA and TA. And of course we will keep the little man in our prayers!! Such a beautiful boy. Waiting for PA has got to be nerve wracking. I can’t imagine they wouldn’t approve you to be his family, though. Keeping Sheperd and the rest of your family in my prayers! He’s such a doll baby, Stefanie. Truly … a doll baby! Here’s hoping that you receive PA soon and that you’re one step closer to your baby boy. Oh he is so special, I have no doubt that everything will fall into place perfectly for you. he is so sweet looking. I can’t believe there is infants to one care giver-oh man you gotta get this kid home-My prayers are with you and I know God’s ears are open! God Bless you and your family. I am also worried bout ourMJ in China there is a cold frontthat hit Nanchang and it is snowing and icy! Put that with no heat-those poor children! I will keep your family and sweet Shepherd in my prayers. He is just too cute! Shepherd is so beautiful. I’ll keep you all in my thoughts and hopefully you will receive your PA and LOA shortly so that he can come home to you. I will keep Shepherd in my prayers. He has such a beautiful little face. That smile just lights up! I am very excited for your family. Keep the faith! You continue to amaze me at your ability to put your faith and trust as well as your fears and concerns in the Lord knowing his plans are perfect. Your family has opened my eyes to a side of SN adoption of was unaware of. It seems God may be using your family to lead my family in a new direction. Thank you for your faithfulness. Oh I so can’t wait either!! Hope you hear SOON and that an update is on it’s way too…I pray for little Shep daily. We will pray for his needs and for all the prep you need to do to get him what he needs…I have a feeling all of that will fall into place. When I look at him, I just melt, such a beautiful boy, so meant to be with you. It will all come together as it should, in the meantime, we pray! What a cutie your little Shepard is! Our daughter is at the same orphanage as Shepard and close to the same age, I believe. Our LOI is flying it’s way to China tomorrow so we are just beginning our wait for PA. Glad I found you and can’t wait to follow your journey! We are in Mississippi so not too far from you!